Shoal is extremely excited to be platinum sponsors of the Systems Engineering Test and Evaluation Conference (SETE). 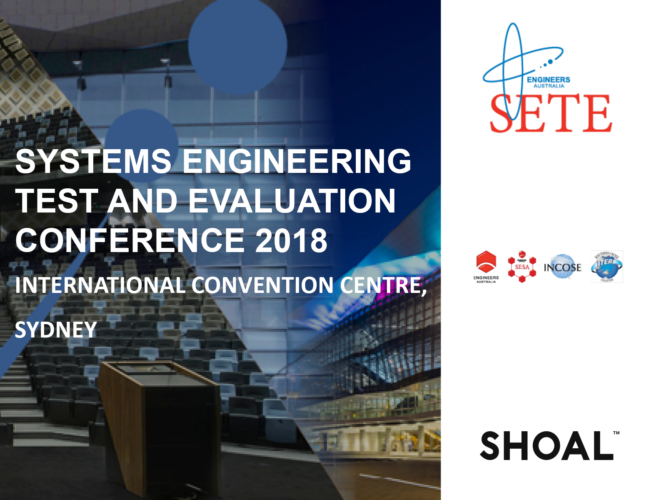 SETE 2018 is an annual conference organised by of the Systems Engineering Society of Australia* (SESA) and the Southern Cross Chapter of the International Test and Evaluation Association (ITEA). This year, the conference is themed around unlocking the future through Systems Engineering and Shoal continues to advance its Systems Engineering (SE) excellence by taking a lead in shaping the body of SE knowledge. Our talent at Shoal continues to strive to address the biggest challenges the SE Community has and provide some of the answers. Six papers have been accepted into the conference that cover a range disciplines like model-based systems engineering and asset management; across a range of domains from transport to Defence. These papers are the outcomes of our internal research programs, our commitment to the Systems Engineering community and, where appropriate, our advanced client programs. Jon Hallet and his co-authors are reporting on an industry wide workshop to exploring the opportunities and challenges for sharing of models across the contractual boundaries during the conceptual design phase of a capability life cycle. Duane Jusaitis’s paper describes the framework developed to support the analysis of capability scenarios to support the ongoing management of Capability effectiveness over a Capability lifetime covering many decades. It also explores the integration of Project models into an overarching Program-level model to facilitate more detailed analysis. Bradley Hocking and Chris Sproston report of their development of a model-based approach to asset management in the rail sector, moving the focus from documents to information. The show how this single source of information (the model) can have many advantages, including: removal of duplicated information; efficient configuration management; and greater monitoring of the Asset Management Systems. 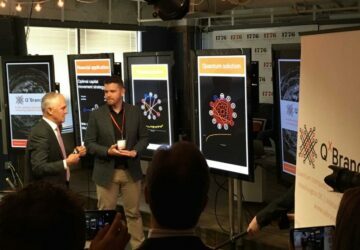 Chris French, working with Steven Heard of Clearz Defence, has described how new methodologies and visualisations can be utilised to better inform decision makers. Working with Program owners of complex systems they have facilitated the codification of program level information to enhance the richness of information presented to stakeholders to better inform their decisions. Stephen Cook and our CEO Shaun Wilson will present an argument for the investment in systems engineering in the early stages of Projects and Programs, supported recommended levels of expenditure on specific activities that provide the greatest payoff in the early stages of the lifecycle. Jon Hallet and his co-authors explore the role of scenarios in model-based management of capability program. They consider the derivation of the justification for projects that can be derived from analysis of the current and proposed capabilities in Program-level scenarios against an agreed set of Program-level Measures of Effectiveness.